Barbara Streisand on Oprah(Oct 14/2003), dedicating her song “Smile” to her recently deceased dog Sammy. Her new dog Samantha joins her on stage. Barbara’s recording of Chaplin’s “SMILE“, first heard in Chaplin’s 1936 classic comedy, Modern Times(from her album “THE MOVIE ALBUM”) was named ” Official Anthem of Spirit by Humane Society of United States. 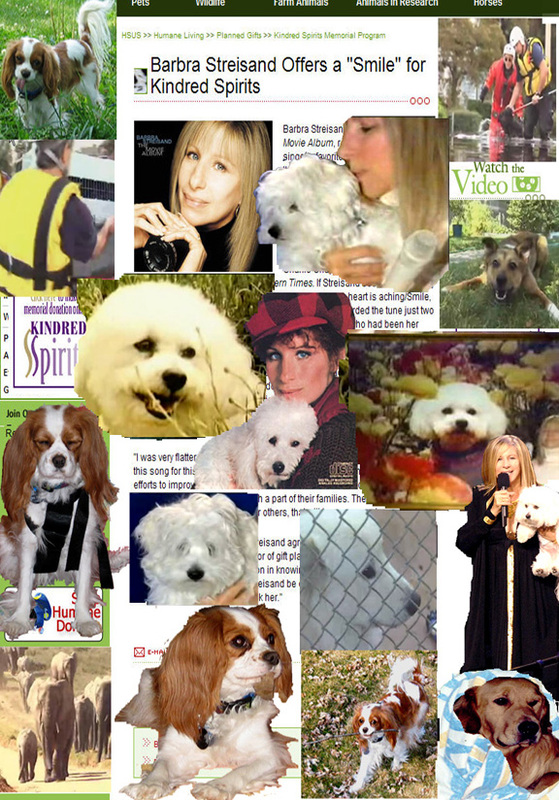 Barbara recorded it two days after the death of her bichon frise, Sammy, who had been her companion since 1994. The HSUS contacted the artist’s representatives to express their condolences after reading about Sammy’s death. Barbara responded and graciously granted The HSUS the right to use her recording in conjunction with our Kindred Spirits memorial program. “Smile” is now the official Anthem of Spirit for those who have experienced the loss of a pet. I too recently suffered the loss of my dog TJ, a 7 y.o. Bichon Bolognese. It is a heart-breaking experience.